**1st Author, Part-time Lecturer, Department of Distribution Management, Jangan University. ***Part-time Lecturer, Department of Distribution Management, Jangan University. ****Corresponding Author, Assistant Professor, Department of Distribution Management, JangAn University. Received: June 14, 2013. Revised: November 27, 2013. Accepted: January 16, 2014. Purpose -In this study, we inspected the effects of public-service advertising (PSA) and commercial advertisements onconsumers' social and emotional values. Specifically, we includesource credibility on advertising models as a mediating variableto compare the path difference between the social and emotionalvalue of consumers, and to test the appropriateness ofadvertising expenses. Research design, data, methodology - A total of 219copies of effective questionnaires were used and methodologiessuch as Cronbach’s alpha, paired samples t-test, and structuralequation modeling (SEM) were conducted. Results -The results showed that the consumer model waseffective at PSA, while celebrities and CEOs were effective atcommercial advertising. Further, only credibility (among sourcecredibility) made a significant difference in the test of PSA modelsof both PSA and commercial advertising that consumerspreferred. Conclusions - The advertising model types varied dependingon advertising types (for example, PSA and commercial advertising).Therefore, celebrities and CEOs appearing in commercialadvertising should have no ethical or moral defect by self-control,and marketers should elect the model considering such afact. JEL Classifications : M10, M31, M37, N30, N35. Key Words : Types of Advertising Model, Source Credibility, Consumer Value, PSA, Commercial Advertising. At the end of 2012, a newspaper article that renowned celebrities in the nation were paid people's tax amounting to as much as 570,000,000 Won created a lot of criticism. They reported that entertainers and/or sports stars who worked for public organizations as PR men were not paid wage, as some of well-known entertainers were paid high wage to let consumers think as defects on the morality of celebrities. Even if such an article became a gossip, consumers did not make change of viewpoints on many well-known entertainers who made appearance at public interest advertising. These negative phenomena associated with visual clues can be found in the definition of the IAA (The International Advertising Association) and Ad C (Advertising Council)’s about public service advertisement (PSA). Specifically, IAA defined that PSA would accept common people's governing opinions to support social and/or economic activities and to help put into practice. And, Ad C defined that PSA should be managed by non political organization to be fair and to get rid of benefits of specific object and to launch public service campaign for all of the people. In other words, PSA recommended social and economic activities for common people and got rid of profits for specific object to meet match-up hypothesis on advertising and its models and to violate consumers' cognition on 'Models of public service advertisement give their talent without compensation'. In contrast to these debates, Yang (1988) reported that the commercial advertising is interested in advertising model's role of information source that can give message effectively. An advertising message expresses an advertiser's idea to let consumers cognize product advertising in meaningful and desirable way, and Lee (2005) reported that advertising message is very much important for advertiser and/or advertising agent to find out influence upon attitudes and changes of the individuals. Therefore, advertisers who are forced to pay enormous amount of appearance fee of actors of public service advertisement and/or commercial advertisement should inspect effects and efficiency of expenses. Inspection into types of advertising models and advertising effects that find out effects of advertising models is not persuasive, and current studies make use of many parameters to inspect effects of reasonable advertising models, and outcome of the studies relies upon use of parameters and methods of investigation. We were found that advertising effect might vary depending upon characteristics of the model of both PSA and commercial advertisement (Shin et al, 2012). In this study, we inspected effects of PSA and commercial advertisement upon consumers' social values and emotional values. Especially, we includes source credibility on advertising model as mediating variable to compare path difference between social value and emotional value of consumers and to test appropriateness of advertising expenses. We were looking forward to the findings are likely to give various kinds of information on transfer effects of advertising messages in which many advertisers are interested. Especially, the findings shall give direction on credibility of consumer values that are thought to be important for selection of advertising models depending upon advertising types and to select systematic and credible advertising models and to elevate effects of transmission of advertising messages as many as possible. Furthermore, the advertising models such as celebrities are able to control and develop themselves at credibility areas for consumers to be likely to have values of effective models. The advertising model means person, animal and other media that make appearance at the advertising to attain goal, or to give values and/or images. Song (2008) argued that the advertising model gives information and/or message of the product on behalf of advertisers and to make change of attitudes of many and unspecified consumers and/or users and to help take buying action. The advertising model makes appearance in the advertising to help users and/or consumers understand advertising message and to memorize appeal of the message: So, the model can have function of authority, reliability, celebrity, identification and transfer (Lee et al., 2006). The advertising model can be effective when attributes of the product coincide with model images (Baker & Churchill, 1977). Lee et al. (2006) reported that the advertising model can be classified into celebrity model and non-celebrity model depending upon public cognition and professional model and non-professional model depending upon having professional knowledge on advertising products. In this study, advertising model was classified into four types: celebrity models of group of actual and/or virtual characters who have public cognition in the society (McCraken, 1989), professional model that has professional and good knowledge on advertising product (Ohanian, 1990), common citizens model who are thought to have other professional knowledge than experience of ordinary use, and top management group that has obtained professionalism and reliability in the advertising (Lee et al., 2006). Public organizations advertise to make change of attitudes for benefit of the society, and enterprises are making effort to advertise more than competitors and to differentiate images of their products and services. These days, advertising needs to draw consumer's attention at congestion of the advertisement disclosed as well as keen competition. Because paying attention is a prerequisite of information processing (Hovland et al., 1953), if consumers who do not pay attention of advertising, marketers can not expected that consumers have advertising attitude, brand attitude and buy advertising that can be the attitude change process toward advertising. From a different perspective, Lynch & Schuler (1994) argued that not only advertising model characteristics but also product characteristics could be in good harmony to elevate advertising effects, and Kamins & Gupta (1994) argued that images of both advertising model and product had close relations to coincide each other and to have effective advertising. The studies based on match-up hypothesis are originated from conditioning theory of investigation into advertising effects depending upon model types (Friedman & Friedman, 1979; Kanungo & Pang, 1973). According to conditioning theory, the information source of advertising can be persuasive depending upon product types. In addition, the above-mentioned the schema match may have affirmative influence upon advertising effects. The schema is defined to be human cognitive structure that has shown systematic knowledge on types of concepts and/or stimulus (Fisk & Taylor, 1984). According to Taylor & Crocker (1981), it plays an important role at symbols, storing and use of the information. In other words, the schema discloses coincidence between new information and existing knowledge system to let men infer the information and help interpret new information in effective way (Lee, 2005). Therefore, enterprises and/or organizations that make use of advertising are interested in advertising strategy that can increase readership score, for instance, testimonial ad that makes use of endorser. According to Arens (1996), the testimonial ad assures of products by using attractiveness, professionalism, reliability and similarity of advertising models to have favorable attitudes and buying ideas by public confidence on the models. Well-known persons, professionals, common consumers and top management are often used at testimony ad to assure of products. Ohanian (1990) explained that the source credibility consists of ethos, prestige, reputation, status, authority and competence. In this study, source credibility has been classified into four levels, that is to say, credibility, likeability, attractiveness and expertise. Lasswell (1948) was first claimed that information credibility plays role at persuading process, Hovland & Weiss (1951) developed this and announced that information source having high credibility has more influence upon audience opinions. Various studies such as Crag & McCann (1978), Hovland et al . (1953), and Woodside & Davenport (1974) on the source credibility that the credibility of information source has knowledge, technology and experience on communication subject to give not only opinions without bias but also objective information and to have persuading effects of messages given by advertising models. The likeability is said to like an advertising model by consumers, and to produce it by various kinds of reasons and to let consumers be persuaded by likeability of the model that expresses love of specific object. It can be expected that an advertising model that is included in consumers' reference group is much likely to persuade. Studies on attractiveness of advertising models described characteristics and/or reaction of the attractiveness, and the attractiveness was recently called theory of psycho-socionomics to have influence upon psychological stability, pride and confidence (Kim & Jeon, 2009). According to Erdogan et al. (2001), the attractiveness had characteristics of familiarity, likeability and similarity of information source, it defined to be consumers' familarity and good impression toward advertising models. In many studies such as Friedman & Friedman (1979) and Kelman (1961), advertising effect of the attractiveness identified attractive advertising models to make change of not only consumers' attitudes (Kelman, 1961) but also belief of target consumers by attractive models and to have more buying ideas (Friedman & Friedman, 1979). According to Hovland et al. (1953), the expertise of advertising model was defined to be source that message messenger asserted, and McCracken (1989) defined to be knowledge and/or competence that advertising models asserted to be appropriate. Previous studies such as McGuire (1968) and Ohanian (1991), studies on advertising, the expertise played great role than other factors did. The social value of consumers' values composed extensively by Sheth et al. (1991) is defined to be able to elevate consumers' values. Therefore, not only preference of advertising model but also source credibility upon the model makes attitude toward PSA and/or commercial advertising influenced by others. The emotional value is said to move by products and/or services and to have influence upon emotional state (Sheth et al.,1991), and to be emotionally affected by preference of an advertising model at PSA and/or commercial advertising. So, consumers' social values and emotional values at advertising type, advertising model characteristics and the model's credibility may have influence upon purchasing intention, preference, satisfaction and cognition, etc. As said before, effect of advertising of celebrity endorser can be expected in accordance with match-up hypothesis, schema coincidence, conditioning theory and social comparison theory, etc. The conditioning theory explained that repeated connection of both unconditional stimulus and conditional stimulus can transfer emotion of unconditional stimulus to subject with neutral attitude (Staats & Staats, 1958). In other words, consumers can connect a model's attractiveness and/or good impression with their public confidence to have influence upon their values and to make change of buying behavior and/or attitudes. The overshadowing effect can evidence the fact. According to Till & Shimp (1998), the overshadowing effect is said to prevent consumers from remembering a product because of a famous model's overlapped appearance at many product advertising. As a result of this, consumers who remembers advertising can be confused. The principle of figure & ground that is based on perception of the psychology can explain the phenomenon. Perception result may vary depending upon either figure and ground, and an advertising model who does not play role of supplementation of goal of the advertising cannot expect of effect of advertising. The social comparison theory was supported by Festinger (1954). Festinger (1954) said that men had motives to compare competence and opinions of their own with those of others and to have basic goal of comparison of self-test. And he explained that men had a motive of continuous improvement by comparing them with other persons. So, social comparison was thought to be a controlled and directional process that could satisfy one's own desire. Therefore, he was considered that common people have cognition on the harmony, schema, conditions being exposed to stimulus and comparison with others to make change of their own values. From the different perspective, we proposed in this study as well as other studies that the social value is likely to have influence upon emotional value according to Brockner (1988)’s behavioral plasticity theory (BPT). Originally, the BPT that is conceptional base to understand role of self-esteem makes change of personal behavior by external environment, in particular, social cues. BPT can be classified into two references: First, individuals do social comparison to act specifically. Individuals rely upon social bases that govern their own belief and behavior, and they do social comparison to be free from uneasiness on properness of belief and/or behavior. The factors that have influence upon uncertainty of individuals may have influence at comparison process. From this perspective, consumers compare their selection processes (and process before selecting) of attributes and/or public confidence of advertising models to be influenced. Second, self-diagnosticity, self-diagnostics that controls effects of negative feedback to let individuals compare feedback with ego concept and to follow others' attitudes and desire by recognition about one’s strategic compliance. As, consumers who can check ego concept of social reaction on public confidence upon advertising models are likely to increase or decrease levels of their emotional values. Research model and hypotheses based on precedent studies were illustrated in Fig. 1. Hypothesis 3: PSA and commercial advertising has differently influence path upon consumers' values by advertising model type and source credibility, respectively. Specific path models were used to test the hypotheses 3 were illustrated in Fig. 2. In this study, advertising models were classified into celebrities, professionals, consumers and CEO to test appropriateness of PSA and commercial advertising and to inspect consumers' source credibility upon PSA and commercial advertising. The study investigated consumers' cognition on both social value and emotional value of all of advertising and made models with mediating variable of source credibility of advertising models to examine effects of advertising model types upon consumer values. 219 copies of effective questionnaires were used, and the participants consisted of 92 male (42.0%) and 127 female (58.0%), and 79 married (36.0%) and 140 unmarried (64.0%). Participants’ average age were 30.34 years (SD = 13.267), specifically, the male were 28.59 years old on average (SD = 12.62), and the female were 31.61 years old (SD = 13.62) on average. The following self-report measures were used. Specifically, types of advertising model were measured each 5 item of celebrities, professional, consumer and CEO likert 5-point scale based on Friedman & Friedman (1979), source credibility of advertising model was measured 13 item, likert 5-point scale based on Hovland & Kelly (1950). Not only social value but also emotional value was measured each 4 item, likert 5-point scale based on Shet et al. (1991), Sweeney & Soutar (2001), and Wang et al. (2000). In this study, Cronbach was α used to test reliability and to evaluate internal consistency of measuring items. According to Nunnally (1978), Cronbach α coefficient should exceed 0.7. In this study, Cronbach α was 0.726 or more to be ensure the reliability except for the product. Analyses of the results for the validation of the variables, the confirmatory factor analysis was completed with maximum likelihood estimation. The results of factor loading of each factor exceeded 0.5 to have construct validity, and AVE(average variance extracted) of each variable exceeded 0.5 to have convergent validity. These results are shown in <Table 1>. A confirmatory factor analysis (CFA) was done to investigate relations and direction of the variables by correlation analysis. The mean, standard deviations, and correlation matrix are shown in <Table 2>, and <Table 3>. At comparison of coefficients of both public service advertising and commercial advertising by Fisher r-to-z transformation(http://vassarstats, net)1). 1) In this study, one group was given two questions of both public service advertising and commercial advertising, and comparison of correlation coefficients of two independent groups by Fisher r-to-z transformation may be different. The results of difference in the correlation coefficient test, the relation between consumer model and likeability of PSA had more significant difference than that of commercial advertising had. 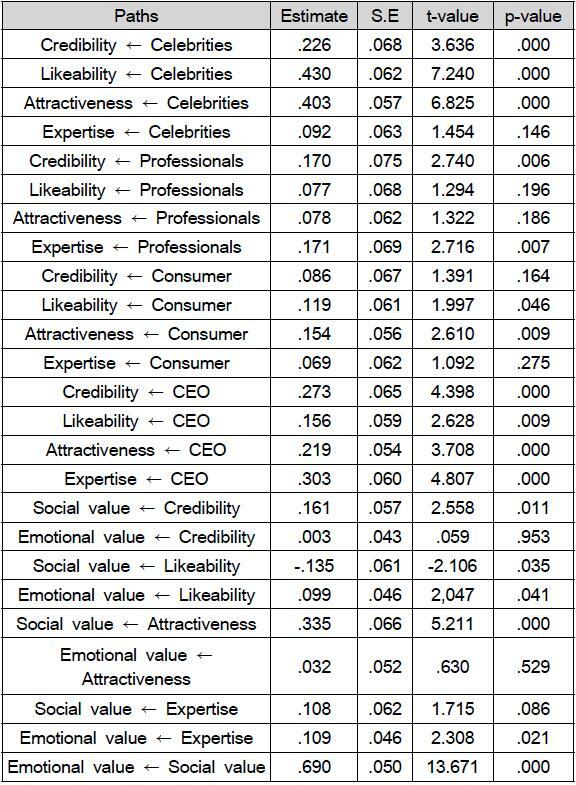 Relation between celebrities and likeability (PSA: r = .41, commercial advertising: r = .60) had more significant difference than that of commercial advertising had (z= -2.68, p<.01). In order to validate the hypothesis 1, we verified paired samples t-test, and then the results showed that consumer model was effective at PSA, while celebrities and CEO were effective at commercial advertising. Therefore, Hypothesis 1 was partially supported. Also, the results of paired sample t-test showed that only credibility among source credibility had significant difference at test of PSA models of both PSA and commercial advertising that consumers preferred. Therefore, Hypothesis 2 was partially supported. In order to validate the hypothesis 3, the study investigated structural equation path model of PSA, and the results of the modified model indicated fit indices: χ2 =359.275, d.f = 20, p = .000, GFI = .719, AGFI = .228, NFI = .561 and RMR = .138 to be unsatisfactory and to investigate paths among advertising models-source credibility- consumer values of not only public service advertising but also commercial advertising. These results are illustrated in <Figure 3> and shown in <Table 5>. 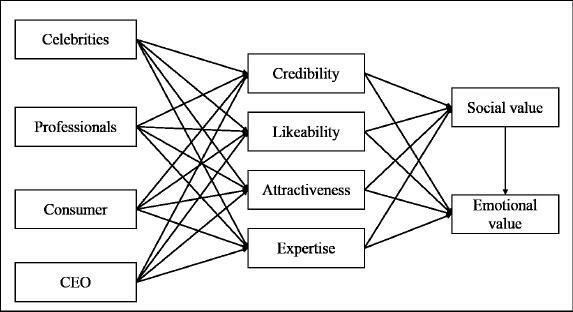 As illustrated <Figure 3>, and shown in <Table 5>, celebrities had positive influence upon credibility, likeability, attractiveness and expertise of PSA, and professionals did upon attractiveness and expertise, and consumers did upon credibility, likeability and attractiveness, and CEO did upon credibility and expertise. And credibility, likeability and attractiveness had positive influence upon consumers' social values, and likeability and expertise did upon emotional values, and social values did strong positive impact upon emotional values. In order to validate the hypothesis 3, the study investigated structural equation path model of Commercial Advertising, and the results of the modified model indicated fit indices: χ2 =307.312, d.f = 20, p = .000, GFI = .757, AGFI = .333, NFI = .621 and RMR = .119 to be unsatisfactory and to investigate paths among advertising models-source credibility-consumer values of commercial advertising. These results are illustrated in <Figure 4> and shown in <Table 6>. 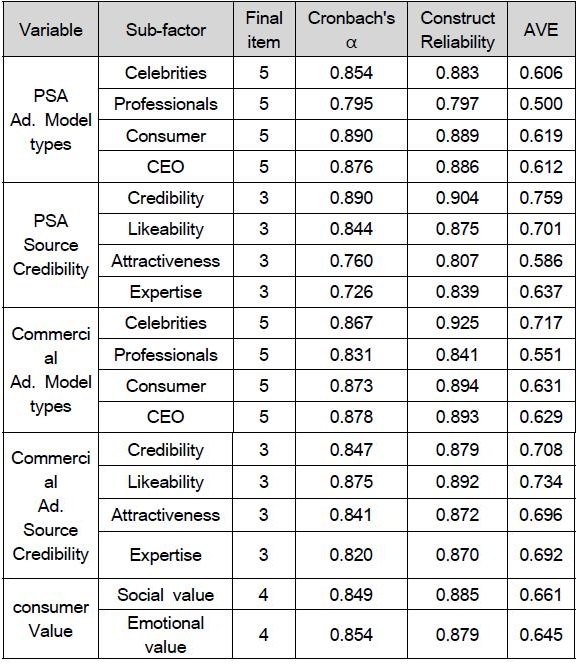 As illustrated <Figure 4>, and shown in <Table 6>, celebrities had positive influence upon credibility, likeability, and attractiveness of commercial advertising, and professionals did upon credibility and expertise, and consumers did upon likeability and attractiveness, and CEO did upon credibility, likeability, and attractiveness and expertise. And credibility, likeability and attractiveness had positive influence upon consumers' social values, and likeability and expertise did upon emotional values, and social values did strong positive impact upon emotional values, too. Therefore, Hypothesis 3 was supported. This study investigated effect of advertising model types of both PSA and commercial advertising upon consumers' social values and emotional values. Especially, mediating variable of source credibility upon advertising models was used to compare paths between consumers' social value and emotional value depending upon advertising characteristics and appropriateness of advertising expenses paid. As a result of the study, there are at least three important managerial or theoretical implications from this study. First, the advertising model types varied depending upon advertising types, for instance, PSA and commercial advertising. The consumer model was effective at public service advertising, while celebrities and CEO were done at commercial advertising. The consumers could think of similarity with consumer model of PSA by social comparison. Celebrities' advertising message made consumers pay attention more than common people's (i.e. consumer) message did to remember important advertising information suggested by Erdogan (1999) and Kaikati (1987)’s studies, and, CEO model made consumers pay attention to let them rely upon products and services because of the social status of CEO. Therefore, celebrities and CEO who made appearance at commercial advertising should have no ethical and moral defect by self-control, and marketers should elect the model considering such a fact. Second, only credibility of advertising model about the source credibility oft the advertising mode had significant difference. This result explained that the information source with high credibility could be accepted better than the one with low credibility based on learning theory was done argued by Cha (1989). Based on Cha (1989) and generally, the PSA recommended activities that were beneficial for common people, and got rid of benefit for special group to let consumers have reliability. In other words, celebrities who were paid at advertising cognized to be PSA by consumers could lessen effects of PSA. Lastly, path of PSA model differed from that of commercial advertising model. celebrity model of PSA had influence upon credibility, likeability, attractiveness and expertise, and professional model did upon attractiveness and expertise, and consumer model did upon credibility, likeability and attractiveness, and CEO model did upon credibility and expertise. 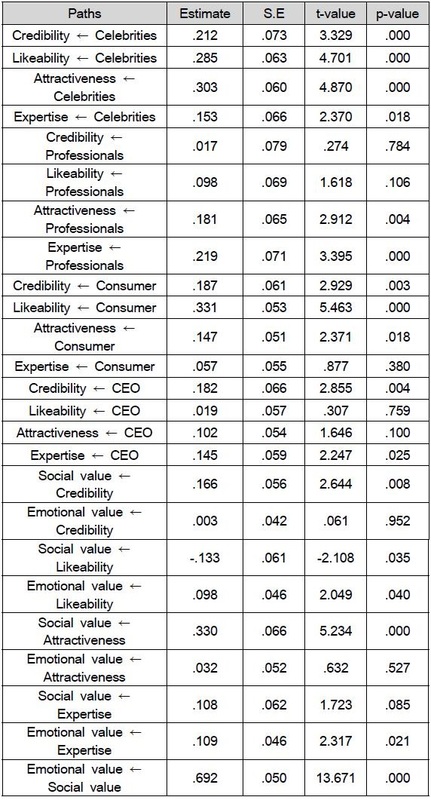 On the other hand, celebrity model of commercial advertising had influence upon credibility, likeability and attractiveness, and professional model did upon credibility and expertise, and consumer model did upon likeability and attractiveness, and CEO model did upon credibility, likeability, attractiveness and expertise. The likeability of advertising model of not only PSA but also commercial advertising had influence upon social value as well as emotional value of consumers, and credibility and attractiveness did upon social value, and expertise did upon emotional value, and social value did upon emotional value. The marketers shall select advertising models in accordance with advertising characteristics to get successful advertising effects from consumers, and inspect that concept of the models meets that of products and/or services. There are at least several potential limitations in this study that need to be considered: First, the subject of the study was consumers at metropolitan area to be difficult to generalize the findings. So, further studies shall expand regions and/or subject to investigate difference of influence of advertising between Seoul and local areas. Second, in this study, we did not analyze the mediating model of source credibility could not find out difference between individual effects and advertising types. Further studies need to inspect mediating effect of source credibility of advertising models and to examine difference depending upon advertising models by adding moderating effects. And, consumer values such as social value and emotional value were difficult to compare effect of both advertising types and not to examine exactness of advertising effect. Further studies shall inspect variables such as advertising loyalty, purchasing and/or practice intention to verify direct advertising effects. Other limitations of common practical study have not been mentioned herein. 1.Baker, M. J., & Churchill, G. A. (1977). The Impact of Physically Attractive Models on Advertising Evaluations. Journal of Marketing Research, 14(11), 538-555. 2.Brockner, J. (1988). Self-Esteem at work: Research, Theory and Practice, Issues in organization and management series. Lexington, MA: Lexington Books. 3.Cha, Bae-Keun (1989). Persuasive Communication, Seoul, Korea: Seoul University Press. 4.Craig, C. S., & McCann, J. M. (1978). Assessing Communication Effects on Energy Conservation. Journal of Consumer Research, 5(Sep.), 82-88. 5.Erdogan, B. Z., Baker, M. J. & Tagg, S. (2001). Selecting celebrity endorsers: the practitioner's perspective. Journal of Advertising Research, 41(3), 39–49. 6.Festinger, L. (1954). A Theory of Social Comparison Processes. Human Relations, 7, 117-140. 7.Fisk, S. T., & Taylor, S. E. (1984). Social Cognition. Reading, MA: Addison-Wesley. 8.Friedman, H. H., & Friedman, L. (1979). Endorser Effectiveness by Product Type. Journal of Advertising Research, 19(5), 63–71. 9.Hovland, C. I., Janis, I. L., & Kelly, H. H. (1953). Communication and Persuasion. New Haven, CT: Yale University Press. 10.Hovland, C., Weiss, W. (1951). The Influence of Source Credibility on Communication Effectiveness. Public Opinion Quarterly, 15, 635-650. 11.Kaikati, J. G. (1987). Celebrity advertising: a review and synthesis. International Journal of Advertising, 6(2), 93-105. 12.Kamins, M. A., & Gupta K. (1994). Congruence between spokesperson and product type: a matchup hypothesis perspective. Psychology & Marketing, 11(6), 569–586. 13.Kanungo, R. J., & Pang, S. (1973). Effects on Human Models on Perceived Product Quality. Journal of Applied Psychology, 57(April), 172-178. 14.Kelman, H. C. (1961). Processes of Opinion Change. Public Opinion Quarterly, 25(1), 57-78. 15.Kim, Mi-hey & Joen, Jung-Ok (2009). A Study on the Negative Emotions about Highly Attractive Model in Ads. Korean Journal of Consumer and Advertising Psychology, 10(2), 183-207. 16.Lasswell, H. (1948). The structure and function of communications in society. In The communication of ideas, ed. L. Bryson. New York, Harper. 17.Lee, Jeong-Haeng (2005). Study on the Influence of Advertisement Model types and Message Appealing Types ti Advertisement Effect. Unpublished master's thesis, Hong-Ik University, Seoul Korea. 18.Lee, Jung-Gyo (2005). The Effect of Celebrity-Product Mismatch on Advertising Memory: Role of the Level of Mismatch. The Korean Journal of Advertising and Public Relations, 7(4), 169-192. 19.Lee, Kyung-Yul., Lee, Chull-Young., & Lee, Hyun-Ju (2006). A Study on the Effects of CEO Spokesperson on the Consumers' Product Attitudes and Purchase Intention. Korean Journal of Advertising and Public Relations, 8(4), 302-330. 20.Lynch, J., & Schuler, D. (1994). The Match-up Effect of Spokesperson and Product Congruency: A Schema Theory interpretation. Psychology & Marketing, 11, 417-445. 21.McCracken, G. (1989). Who is the Celebrity Endorse/Cultural Foundations of the Endorsement Process. Journal of Consumer Research, 16(11), 310-321. 22.McGuire, W. J. (1968). Nature of Attitudes and Attitude Change. In G. Lindzey & E. Aronson(Eds. ), Handbook of Social Psychology, (2nd ed.) Reading, Mass: Addision-Wesley, in press. 23.Ohanian, R. (1990). 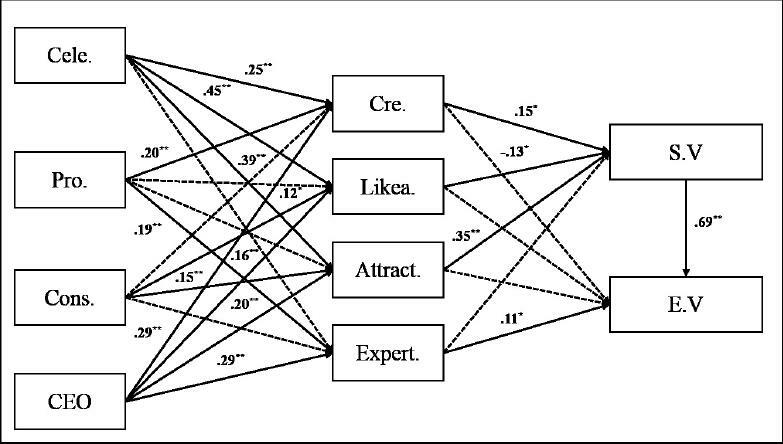 Construction and Validation of a Scale to Measure Celebrity Endorsers' Perceived Expertise, Trustworthiness, and Attractiveness. Journal of Advertising, 19(3), 39-52. 24.Ohanian, R. (1991). The Impact of Celebrity Spokesperson's Perceived Image on Consumer's Intention to Purchase. Journal of Advertising, 31, 46-53. 25.Sheth, J. N., Newman, B. I., & Gross, B. L. (1991). Why We Buy What We Buy: A Theory of Consumption Values. Journal of Business Research, 22, 159-170. 26.Shin, Hyung-Jun., Cho, Young-Chun., & Yang, Hoe-Chang (2012). Effects of Advertising Model Type depending upon Each Form of Advertising upon Advertising Effect. in Proceedings of 2012 Winter International Conference of KODISA, 89-93. (in Publishing). 27.Song, Jeong-Mee (2008). The Congruency between Ad Model and Self Concept: With focus on the Preference of Apartment Brand. Korean Journal of Consumer and Advertising Psychology, 9(1), 25-44. 28.Staats, A. W., & Staats, C. K. (1958). Attitudes Established by Classical Conditioning. Journal of Abnormal and Social Psychology, 57, 34-40. 29.Sweeney, J. C., & Soutar, G. (2001). Consumer perceived value: the development of multiple item scale. Journal of Retailing, 77(2), 203-220. 30.Taylor, S. E., & Croker, J. (1981). Schematic Bases of Social Information Processing. in Social Cognition: The Ontario Symposium on Personality and Social Psychology, (ed.) E. T. Higgins, C. A. Herman & M. P. Zanna, Hillsdale, NJ: Lawrence Erlbaum Associates, 89-134. 31.Wang, C. L., Bristol, T., Mowen, J. C., & Chakraborty, G. (2000). Alternative modes of self-construal: Dimensions of Connectedness and Separateness and Advertising Appeals th the Cultural and Gender Specific Self. Journal of Consumer Psychology, 9(2), 107-115. 32.Woodside, A. G., & Davenport, W. J. (1974). 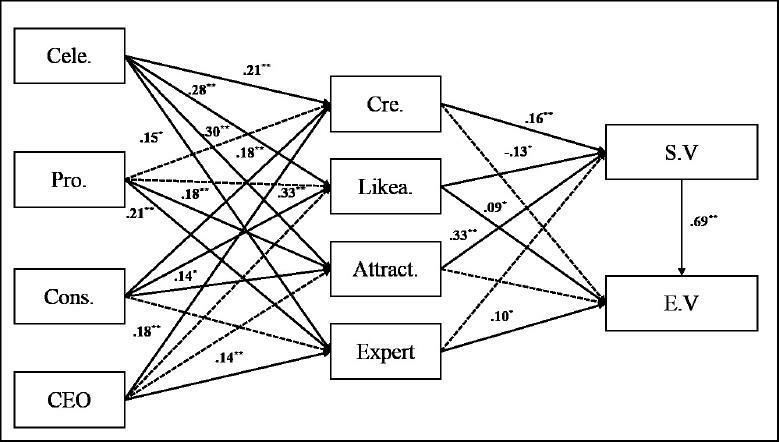 The Effect of Salesmen Similarity and Expertise on Consumer Purchasing Behavior. Journal of Marketing Research, 11(May), 198-202.